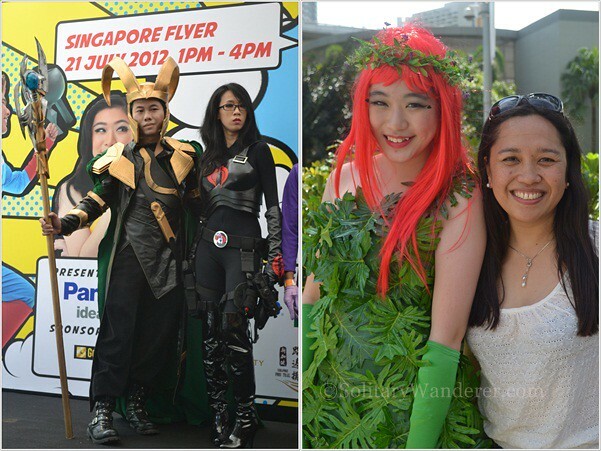 There are a lot of things I love about Singapore, and a recent event I attended only added to the list. It seems that bloggers are highly appreciated in this small city-state. They have an annual blog awards where they invite international bloggers to come and cover the ceremony. I had been lucky enough to be one of the four chosen bloggers from the Philippines. At the top floor of the lovely Landmark Village Hotel in Singapore. Prior to the event itself, the 16 international bloggers from Hong Kong, Malaysia, and the Philippines were treated to a welcome dinner at one of the sponsoring hotels, Landmark Village of the Far East Hospitality Group. Aside from the meet and greet with fellow bloggers, including a Singapore travel blogger that I’ve known only online previously, we also had our portraits sketched (too bad I left mine behind at the hotel) and some had henna tattoos inked on their arms. 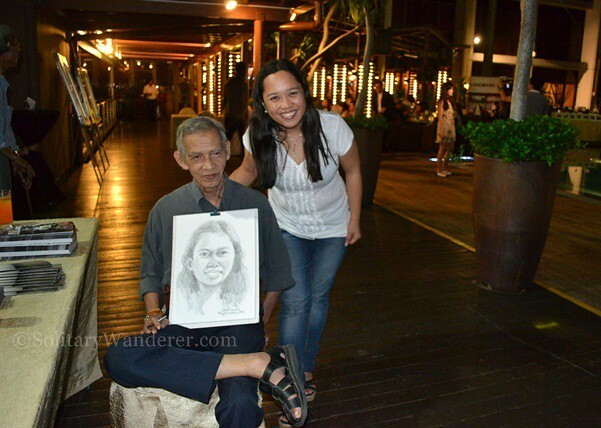 With a portrait artist from Maya Gallery, Singapore. The food was delicious (except for the mango dessert), posing for the artist was fun, and meeting the other bloggers was a great experience. It was at the welcome dinner when I met my Singaporean host Mag Chow of ModGam.com, an über-bubbly and super-fun person to be around, who in my mind, represented the young of Singapore—so full of enthusiasm and verve for life that you can’t help but just be carried away. However, it was the SBA2012 awarding day that we all waited for. After the hotel tour, we all went to the Singapore Flyer where the ceremony was held. With the Philippine contingent, and one representing Penang, Malaysia. I was amazed at the range of niches nominated: from the usual travel, fashion, food, beauty, photography, lifestyle, and video blogs to the far out “best what-the-hell blog.” Don’t ask me what it was all about, even I had no idea! Singapore does appreciate the idea of having fun. Looking at the list of winners, I have to admire their range of nominees and awardees. One winner was an expat, while another was a 6-year-old boy who hammed it up to the crowd together with his 10-year-old brother. The prizes were great! There were electronic items, hotel stays, gift certificates to restaurants and beauty treatment centers, Casio watches, cameras, camcorders, dinner at the Singapore Flyer, and even a free trip to Macau. Check out the list of winners here. A costume contest was held too, and bloggers came in various get-ups. 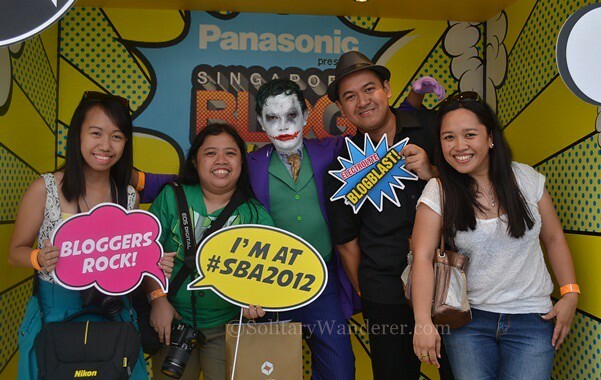 There was Loki, Batman, Poison Ivy, and a smattering of monsters and goddesses, but the winner came from our delegation, a fellow Philippine blogger, Noks Sosa of SiningFactory.com. He won a free weekend hotel stay in Oasia. 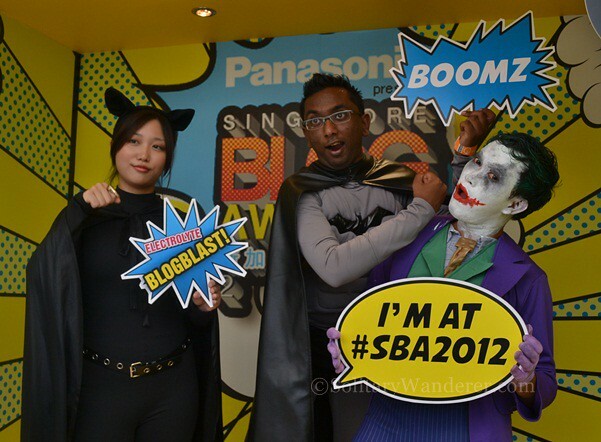 Bloggers in costume in Singapore. With the best in costume awardee Noks Sosa and my Singaporean host Mag Chow. Our day didn’t end with the awarding; we were all given free passes to the Singapore Flyer, and then we watched the fireworks at 1Altitude—it was a tiring, but ultimately a really fun and memorable day. I do love Singapore and I can only thank my sponsors omy.sg, the Far East Hospitality Group, and Orchard Parade Hotel for giving me another opportunity to get to know their beautiful city. 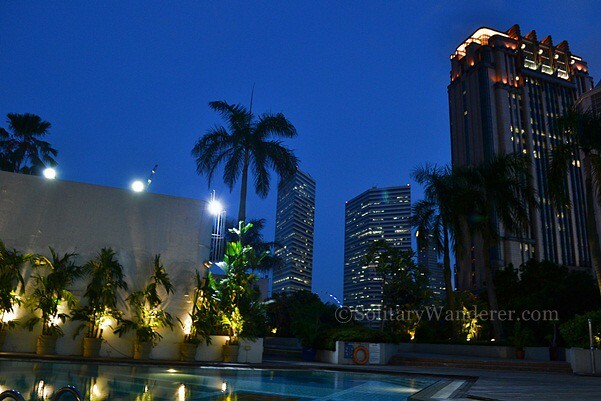 i was in singapore june 2012 for a week.i heard its 1 of asia’s finest and one of the safest place to go shopping. on my 1st day i took the bus with my friends on our way to universal studio.its free if you show your passport and boarding pass. the bus driver handed it back to me in seconds, while my 2 companions had a hard time,the bus driver was so mean and rude. was it because im from the west and they are asian’s? to my dismay on our way back we met the same bus driver.the bus is over 30minutes late on schedule and the people started asking, he just ignored them. 5minutes later he finally open the door and he never said a word. Singapore is a small country, hotels are not that cheap,the service is quite good but not worth the money you pay for the room. there are no pickpockets yes,but that doesn’t mean its safe, for there are lots of fake bargain stuff along orchard road. better go to the big stores and pay a little bit extra. foreigners, filipinos specially they are friendly, educated and courteous. i will never suggest singapore to anyone i know, most singaporean are just not happy people!!! @ Mike: I wonder how different Singapore was 40 years ago? I wasn’t even born then hehe I haven’t had a taste of that civet coffee yet, I can’t afford it! I read the posts “things you like about Singapore” and realized I am probably your oldest follower. I was last there in 1973. OMG that’s about 40 years ago. The item I loved was a coffee that tasted of chocolate. I have never been able to duplicate the taste. I was in heaven! I am afraid that it was the beans that certain cats digest, etc. Who knows. Thanks for the reminder. I loved Singapore! oh my! you watched fireworks over 1- Altitude! i was only working on the restaurant below at level 62, Stellar. I should have met the person who inspired a lot to date a traveler 🙂 greeting from Singapore! i love the photos, i like the post! made me miss our short days in singapore more! Nice meeting you Aleah. Super saya ng Singapore na yan. Hahaha. kakabitin! 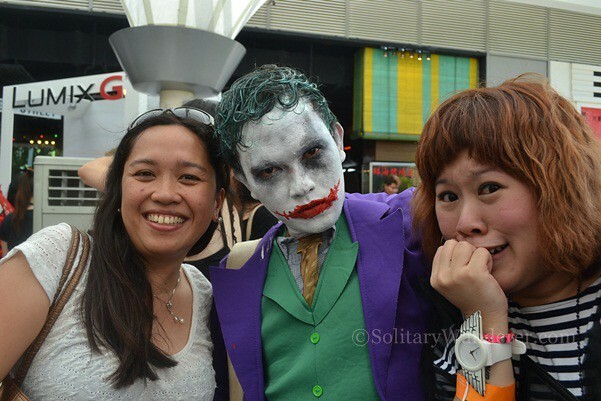 Gwapo nung Joker ah. Hahahaha.